On this tour we head out to Alleppy/Allapuzha famous for its luxury rice barges and backwater tours and the numerous Coir(coconut fibre) factory units. The route is south of Fort Kochi and leads you through very rustic and deep country. Watch fisherfolk deep in thought waiting for the right catch, their women washing clothes and making lunch on an open fire, the kids either partner you on their cycles or wave out happily. Greet locals to their “Hiii, How are you ? Welcome to Kerala!“. Take a break on a desolate beach under numerous coconut palms. Stop at ancient churches and monuments of historical importance. Enjoy healthy Keralan cuisine made just right to please your taste buds while you look out to see folks who brought you your food from the wide open sea. 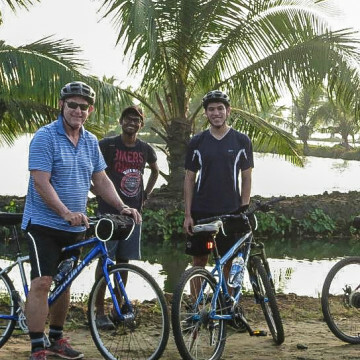 Be surprised to see much more and experience real Kerala on a bicycle. We assemble at the Chinese Fishing nets at Fort Kochi and get ready for the smooth ride along the beach. Your trip leader and cab driver will help you choose the right bike and provide a cycle pouch, helmets and water. Please check your bike for any issues and the trip leader can resolve the issue immediately. Slowly yet steadily we bike through the the colonial streets stopping frequently at spots that give you glimpses and views of the life of a local. The numerous churches and its clergy are a rarity and unique to these parts. Visit the pristine beaches near Alleppey for a sneak-peak into the fisher-man’s life. Watch vividly colored boats on the sea-shore all set and ready. Meet Coir factory laborers in a local Coir (coconut fibre) unit manufacturing door mats, carpets and colored rugs. Try your hand at it to take back products for friends and family. Lunch is provided at an classy backwater home in Alleppy. The cuisine is one we’d love you to experience, it’s a part of the Kerala tradition and it’s a part of our trip. What good is a day out without mouth-watering dishes on your table? A canopied canoe, a seat, soothing wind, some sleep and numerous cormorants and wag-tails puts you right in the midst of nature. Learn the rural ways of living with your boat-man around this beautiful lake. Watch rural Kerala on the road and off it on this classic tour of Kochi. We head back to the good old Fort at Kochi reliving memories of the day that went by.